The iStar sCMOS is an ultrafast platform for nanosecond time-resolved imaging, extracting the best from intensified CCD and sCMOS imaging sensor technologies. 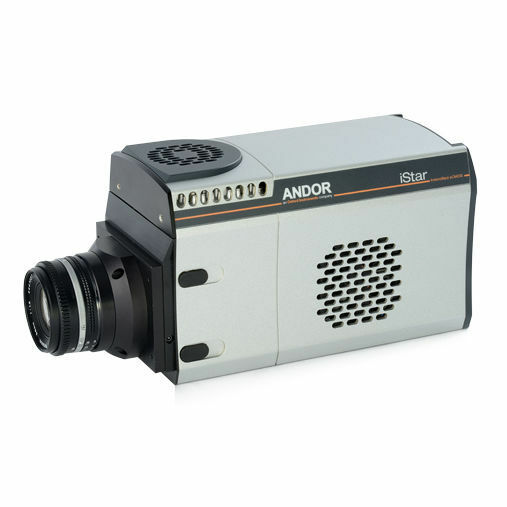 Key applications for this camera include Plasma Studies, Time-resolved Fluorescence / Photoluminescence, PLIF Imaging / Combustion Studies and Hyperspectral Imaging. - 50 fps acquisition rates; Sustainable rate at full field-of-view, out performs CCD and interline-based ns gated ICCDs with equivalent field-of-view. - 16.6 x 14.0 mm sensor matrix; Large field of view, access more of the useful active area of Ø18 mm image intensifiers without the need for optical tapers. - 2.6 e-read noise; Highest dynamic range even at the fastest frame rates, up to 5 times better performance than the closest interline-based competitor. - 12-bit and 16-bit modes; 12-bit mode for smaller file size and absolute fastest frame rates, 16-bit for full dynamic range. - Up to 32-bit data transmission to PC; On-head intelligence to preserve dynamic range in extensive pixel binning, or high intensity pixel binning scenarios. - TE cooling down to 0°C; Efficiently minimizes dark current noise for acquisitions requiring longer sensor exposure time, e.g. integrate-on-chip mode. - True optical gating < 2 ns; Billionth of a second time-resolution for accurate transient phenomena study. - USB 3.0 interface; Super-fast data transfer at 40 fps full frame with a plug-and-play, user-friendly interface – optical extenders available for operation up to 100 m.
- Integrated in EPICS; Ease of operation in EPICS software-based facilities such as partner particle accelerators and other large scientific experiments.